I travel a lot. A lot. Don’t get me wrong—I know I’m incredibly fortunate to see and photograph the things I do, but sometimes it’s nice to be home. Despite the world-class locations I get to visit, I don’t cease being a photographer just because I’m home. I spend a lot of time exploring and photographing the unsung landscapes near home, landscapes that few would cross borders to photograph, but landscapes that I feel a particular connection to by virtue of a lifetime in California. The landscape is only half of an image. Since the best photography is usually more than simply a picture of a pretty thing, I always try to juxtapose my terrestrial subjects with an interesting sky. And unlike stationary terrestrial subjects, you can stand in one place and without moving, watch the sky do some pretty spectacular stuff: moon, stars, clouds, rainbows, whatever. Sadly, as nice as California’s landscapes are, compared to most places, California has relatively boring skies. If I lived somewhere that gets summer thunderstorms (pretty much anywhere in the United States except the West Coast), I’d find a photogenic tree or creek, then make sure I was there the next time the sky did something special. But in California, I end up doing a lot of moon and star photography (not that there’s anything wrong with that). My foreground options near Sacramento are rivers and oaks (and wildflowers in spring), and I particularly love our oaks (the rivers near town are often overrun with people). The criteria I use when searching for oaks to put with my sky images are a striking shape (with an oak, that’s usually a given), a distant vantage point that allows me to use a telephoto (to magnify to moon without losing most of the tree), and elevation that puts the tree against the sky instead of other hills and trees. Over the years I’ve collected a number of these spots, and will never tire of looking for more. 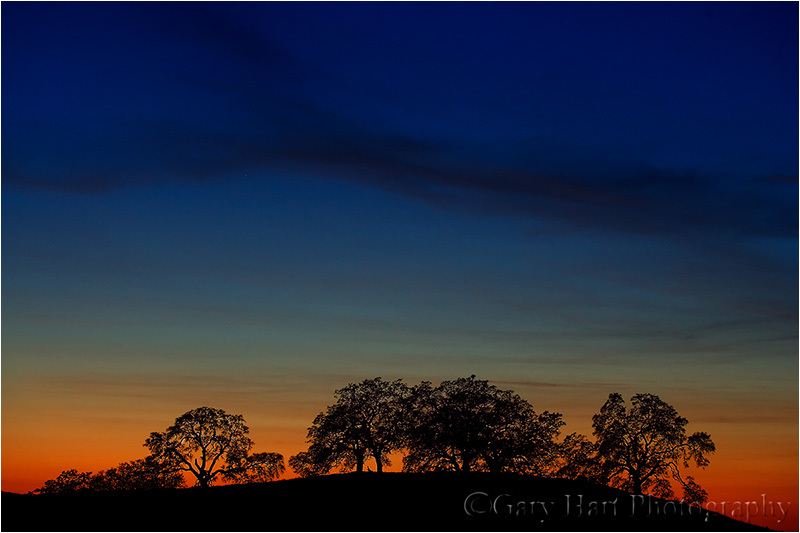 Last week I drove to the foothills east of Sacramento to photograph a thin slice of moon on the western horizon just after sunset. This wasn’t an exploration mission, it was specifically planned to take advantage of a spot I’d found earlier this year. Unfortunately, (as I feared) the developers had found my spot too, and I arrived to find “my” trees surrounded by new homes in varying stages of completion—lucky for a handful of homebuyers, but not so much for all the rest of us who enjoy the foothills’ solitude and pristine views. Just down the hill from this recently found-and-lost spot was the subject of my very first planned moon shoot, an oak-topped hillside that I’d photographed at sunset many years ago, decided that it would look really nice with a crescent moon, then figured out when to return. But this time I found the moon far north (to the right) of its position all those years ago (the closer to the summer solstice, the farther north a crescent moon sets), and it soon became clear that only spot that would work was on a shoulderless, blind curve of a busy, two-land road. Compounding the difficulty, the moon this night was also closer to new (thinner and nearer the horizon), significantly shrinking my window of shooting opportunity, which limited the distance I could hike to get there in time. I made several passes in both directions before finding a safe(ish) place to park, then crammed my car all the way up against a tilting fence, two tires in a drainage ditch, and put on my hazard blinkers. Getting the alignment I wanted required crossing the road, scaling a barbed-wire fence, and traipsing through knee-high weeds. The knowledge that rattlesnakes pretty much rule these foothills made me acutely aware that the weeds were so thick that I couldn’t really see the landing spot for each step. I photographed the entire scene with my Tamron 150-600 on my Sony a7R. As the moon dropped, sliding left to right, I moved forward along the fence line to control the relationship between the descending moon and the trees, starting with wider focal lengths that included some or all of the eight to ten trees capping the hill. Because my route dropped as I moved forward, the moon quickly fell into the trees from my perspective, allowing me to include the moon and trees increasingly tighter compositions. For the night’s grand finale I found an alignment that cradled the moon in the silhouetted branches of a single tree, zooming to 600mm to magnify the moon and eliminate all but one tree. Because a 600mm focal length will catch even the slightest vibration, I went to 800 ISO to maximize my shutter speed in the deepening twilight. Once I shot this I actually rescaled the fence and darted back across the highway attempting to get the moon on the other side of the tree, but by the time I got everything aligned, the trees had been swallowed by the too-dark sky. Every location has features that set its landscape apart. Trees, rivers, lakes, mountains, hills, farmland—I could go on, but you get the point. Your local subject doesn’t need to be spectacular, because when the sky is spectacular, all you need is an interesting terrestrial anchor for your image. The next time you find yourself with time to kill, explore your outskirts and identify unique subjects that you can add to a striking sky. Now, get to work! Wonderful article, prompted me to research a few locations! Great essay and photos, Gary.